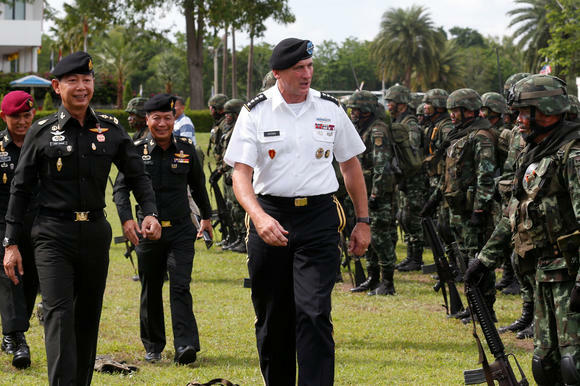 BANGKOK -- Shortly after he was appointed Thailand's army chief last September, Gen. Chalermchai Sitthisad made a priority of visiting all the regiments in a force of 335,000 active-duty troops. It helped drum up the image of an approachable army commander, military insiders said at the time. But military analysts read more into Chalermchai's visits: They were to establish his authority as a stabilizer in an army known for splits between politically powerful factions and military graduating-class loyalties. It appears to have paid off. Charlemchai, who hails from the smaller, less influential special forces troops, was just given another year as commander of the Thai army. His two-year term marks a shift in power within the army -- now a relevant barometer of Thailand's political future, since the ruling military regime, which grabbed power in the May 2014 coup, has shackled all political parties. Chalermchai's extension was part of the annual military reshuffle list released in September, revealing the promotions of 990 senior officers in a top-heavy military with an estimated 1,750 generals. The U.S. military, by contrast, has just over 880 flag officers. This September's reshuffle list had added significance. It was the first to be endorsed by King Maha Vajiralongkorn, Thailand's new monarch following the death of his father last year. Analysts say it indicates the return of the once influential King's Guard -- the First Infantry Division under the First Army Region, which has Bangkok security under its watch -- back into the fold of power. The man to watch, say analysts, is Gen. Apirat Kongsompong, who was commander of the First Army Region and a hawkish King's Guard officer. He is tipped to be Chalermchai's likely successor after being made Assistant Army Chief this month. King Vajiralongkorn also hails from this one-time source of military authority, which was forced into second place in the military hierarchy over the past 10 years by the Second Infantry Division -- the Eastern Tigers, which has the elite 21st Infantry Regiment, known as the Queen's Guard, in its ranks. All but two army commanders since 2004 -- Chalermchai being one -- are Eastern Tiger generals. It was this faction that staged the 2014 coup to topple the elected government and which has since dominated the junta, led by Prime Minister Prayuth Chan-ocha, former army chief and coup leader. "The general trend from the reshuffle seems to show senior positions going to the [King's Guard] army faction, which the new monarch is part of," said Paul Chambers, an expert on Thai national security issues at Naresuan University in northern Thailand. "If Apirat succeeds Chalermchai in 2018, he would be in that post for two years, because he retires in 2020." And he can start promoting "many more senior officers from Wongthewan [or Heavenly Progeny, as the King's Guard is known in Thai] to top army posts," Chambers said. This change coincides with the junta's push to establish a new layer of political authority, the National Strategy Committee, dominated by the junta and the top brass of the defense forces, to keep a grip on the country's future. In late August, the junta revealed names of business leaders who will also be members of the 35-member NSC. It is tasked to ensure future elected governments are legally bound to implementing a 20-year development blueprint for the country which the generals and their political allies have drafted the broad themes. The NSC is not the only straitjacket the next elected lower house of parliament will have to contend with. The junta has the authority to nominate all 250 members to the Senate, which will have a say in choosing the next prime minister -- even one who may not have contested the next polls. "They are all maneuvers by the military regime to legitimize its extension," said a diplomatic source. To some observers, the junta appears to have borrowed a leaf from China's Communist Party, with the NSC having the whiff of a politburo. "This is a new invention, a Thai-style politburo model that is trying to marry Western, parliamentary-style democracy with the Chinese politburo system," said Kan Yuenyong, executive director of Siam Intelligence Unit, a think-tank. It fits into the grand theme of the junta, which has tried to discredit parliamentary politics and reduce the power of politicians, he said. "They want an absolutist system to guide Thai politics." The higher courts, bastions of ultra-conservative values, have also stepped in with timely rulings to please politically ambitious generals, including a ruling which appears to support the military's authority to fire on crowds to quell anti-government protests. Human Rights Watch, a global rights watchdog, criticized the Supreme Court's Aug. 31 ruling, which dismissed criminal charges against a former prime minister and his deputy for ordering troops to mount a deadly crackdown on anti-government protesters, the so-called Red Shirts, in April and May 2010. The court said the case should be heard as an administrative inquiry into officials abusing their positions. During that bloody showdown on Bangkok's streets, 98 people were killed, close to 90 of them civilians, and more than 2,000 people were injured. The military deployed 50,000 troops to clear the capital's streets of the Red Shirts -- a rural, grassroots movement -- who had occupied large swathes of the high-end shopping district during their weeks-long protest against the then military-backed coalition government. Thai researchers revealed that the military had provided 597,500 live rounds of ammunition, of which 117,923 were used. Military snipers were given 3,000 rounds of ammunition, of which 2,120 bullets were used, they said. At the time, the military said its troops were being fired upon by armed elements from within the protesters, who were dubbed "Black Shirts". To date, no officer or soldier involved in that operation has been brought before the courts to face trial. The Supreme Court's verdict is "an institutionalization of impunity -- that the military can get off the hook, and even policymakers can get off the hook as well," said Sunai Phasuk, the Thailand researcher for HRW. "Government and security forces are likely to operate on the perception that they will not be held accountable for violent crackdowns in the future." Insiders among Bangkok's political elite see the writing on the wall: The generals want to remain in power by controlling and caging the politicians. "The junta will not give a civilian the post of prime minister," said Kasit Piromya, former foreign minister and a member of the junta-appointed National Reform Steering Assembly. "It has a strategic program and a reform program, and you don't do that unless you are in charge." No wonder, in some politically informed circles, Chalermchai's name has surfaced as a potential successor to Prayuth as the premier. Chalermchai's allies in the Privy Council, a body of royal advisers, may prove handy when the time comes.